The challenges to participatory policymaking differ across the six Eastern Partnership countries, but all six countries (Armenia, Azerbaijan, Belarus, Georgia, Republic of Moldova, and Ukraine) face shortcomings in the clarity, effectiveness, and inclusiveness of their policy-drafting and evaluation procedures. 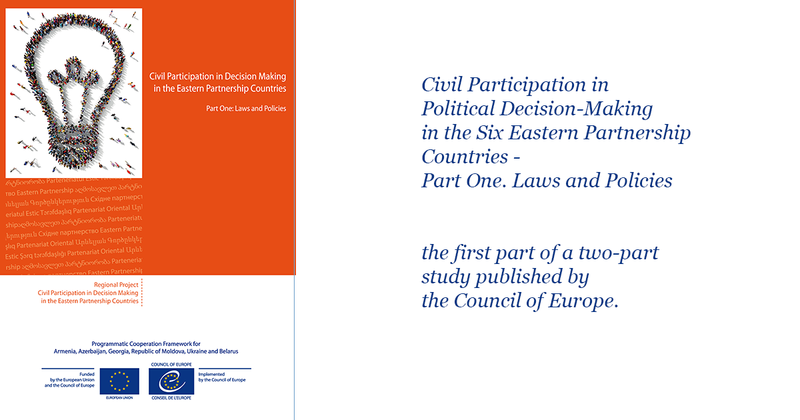 Civil Participation in Political Decision-Making in the Six Eastern Partnership Countries - Part One. Laws and Policies is the first part of a two-part study published by the Council of Europe. The study (edited by New Diplomacy Chair Jeff Lovitt, working with researchers in each country) examines the existing laws, agencies and procedures governing civil participation in political decision-making at national and local level in the six countries, and will be complemented by a second study in 2016 that will examine the experience of implementation of civil participation in political decision-making. The study looks at the policymaking cycle - from green papers (rare in the six countries) to draft laws to parliamentary review - and the processes and forms of participation at the different stages in each country. This is complemented by an assessment of freedom of information laws, budget and financial reporting, avenues for direct democracy - including referenda, petitions and public initiatives, and - the main substance of the study - an examination of laws and procedures to facilitate participatory policymaking. The final section assesses to what extent there is an enabling environment for participatory policymaking. Inclusive policymaking that takes into consideration the views of the wider public, expert communities, and representative organisations of a wide cross-section of society, facilitates the formulation of more effective laws and policies, and strengthens the legitimacy of decision-making at all tiers of government, including local and regional level. But the policymaking cycle requires clarity as well as inclusivity. Clearly stated procedures and timeframes need to be communicated to facilitate civil society participation in the different stages of the cycle to ensure efficient and accountable policymaking. Context and stakeholder analysis, necessary for the impact assessment of draft laws and policies, is an essential part of responsible, accountable policymaking and good governance. Most of all, policymaking that takes into account those whose interests are affected by the implementation of the policies or laws under consideration broadens the ownership of the policies and their outcomes. While the range of decisions and documents where inclusive policymaking can inform better decision-making is vast, this study has focused on consultations around the legislative cycle, starting from a Green Paper – an analytical study circulated early in the policymaking process, with the purpose of opening up a process of consultation and generating debate before a commitment to action or to draft legislation is made – through first drafts of legislation, parliamentary review of draft laws, and final enactment. To place this in context, the study also looks at freedom of information legislation, the transparency of decision-making on national and local budgeting and expenditure reporting, and the existence of established procedures and mechanisms to ensure that participatory policymaking can take place. For civil society participation to be realised, an enabling legal environment needs to be in place, as do procedures and guidelines that govern the consultation process around the formation of new policies and legislation – procedures that are required by law, and accepted by a consensus among all stakeholders, in particular public officials and political parties represented in parliament and government. A strong culture of consultative communications must go hand in hand with a culture of transparency, backed up by freedom of information and clear, consistently applied timeframes that provide enough space for all interested parties to study Green Papers or draft legislation, and to be able to provide informed feedback and recommendations. To support this, ministries, government agencies, and local authorities need the knowledge and resources, including training in the policymaking process, to be able to co-ordinate public consultations around new initiatives and laws – and civil society also needs to possess the necessary expertise and access to information in order to participate as a professional, constructive partner in the process. 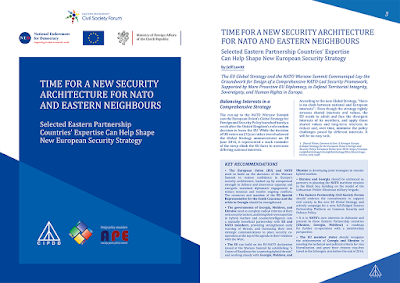 These elements all underpin effective, consultative policymaking, and the study aims to highlight the areas where reforms and greater transparency are needed to improve the quality of the policymaking process in each of the six Eastern Partnership countries. The study is available on the Council of Europe's website here, and is available for download here too.